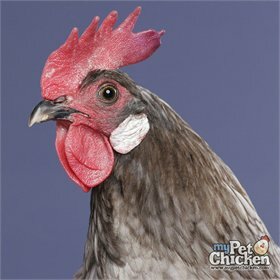 Developed in the Andalucia, Spain, Andalusians are closely feathered, active and good layers of large white eggs. 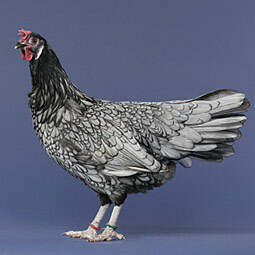 Blue (laced) is the only variety accepted by the APA, but when two blues are crossed, 25% will be black and 25% will be white. (Incidentally, Mendel used these birds in his genetic experiments, thanks to which we know things like two brown eyed people can have blue eyed children.) This breed is rare, but on the comeback thanks to hobbyists!